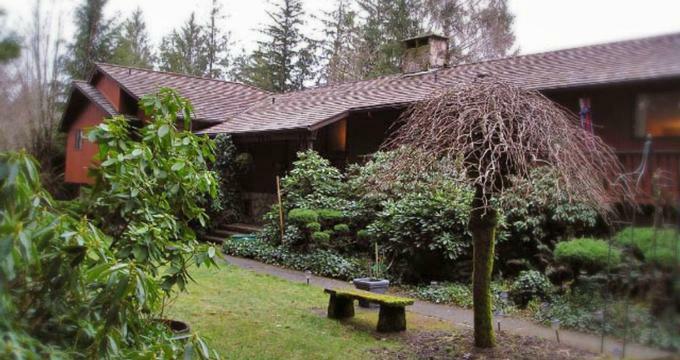 Nestled high on a rain ridge in the midst of the rain forests around Forks in Washington, the Misty Valley Inn is a charming and romantic bed and breakfast that promises an idyllic escape. Set in cozy cedar wood and stone building overlooking the Sol Duc River Valley, this distinctive guest house boasts inspiring views of the Sol Duc meadows and the surrounding woodlands made famous in the ‘Twilight' movies. The Inn is furnished with beautiful antiques and furnishings that reflect the natural surroundings and features comfortable accommodations, modern amenities and unrivaled hospitality and service. 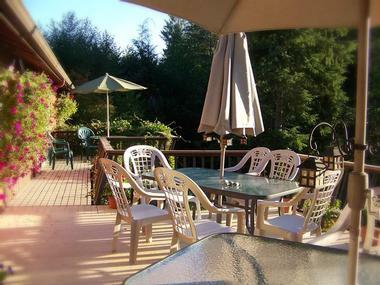 Ideally located for exploring the area, the Misty Valley Inn is within a short distance of the Olympic National Park, the Hoh Rain Forest, the Sol Duc Hot Springs, and Lake Crescent. 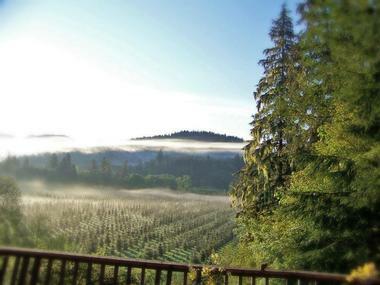 The Misty Valley Inn features four distinct guest rooms, each with their own charm and character. 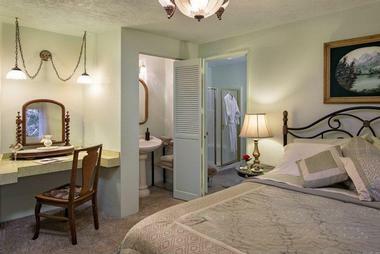 Some rooms have mini-fridges, and complimentary wireless Internet can be accessed throughout the property. The Dutch Room features a king-size bed with luxurious linens, and a private bathroom with double vanities, shower and bath, thick bathrobes, slippers, and deluxe bath products. This room can be combined with the adjacent Cougar Room to accommodate up to four guests if required. The Irish, English and French Rooms all feature queen-size beds with beautiful linens, and private bathrooms with large walk-in showers and single vanities, thick bathrobes, slippers, towels and deluxe bath products. Guests are greeted in the morning with the delivery of a tray of freshly brewed coffee, other hot beverages, and iced juices, as part of the complimentary wake-up call. Breakfast is served in the formal dining room or out on the deck in the summer months against a backdrop of inspiring views of the Misty Valley. The breakfast menu features a range of delicious homemade dishes, including waffles, apple souffle, crepes, French toast, omelets, pancakes, and oatmeal, as well as fresh fruit, freshly baked muffins, pastries and bread, and hot coffee, tea, and other beverages. A complimentary array of freshly baked signature desserts is served with brewed coffee and a variety of drinks every afternoon and evening. 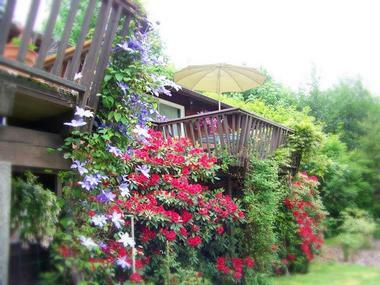 In addition to charming accommodations and welcoming service, the Misty Valley Inn is surrounded by beautifully manicured gardens, which feature a wide variety of roses, shrubs, and trees, as well as a range of beautiful seasonal flowering plants, creating a tranquil place to relax. An outdoor hot tub and spa are situated next to the rose garden where guests can unwind and soak up the spectacular natural beauty of the Misty Valley. The Misty Valley Inn is located in the quaint town of Forks, which is situated along the Olympic Coast, an area of natural beauty. Surrounded by pristine landscapes and rugged wilderness, there is much to see and do in the way of outdoor activities and recreational pursuits in the area, from hiking and mountain biking to wildlife watching and sightseeing. 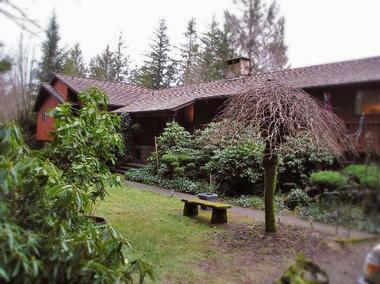 The Inn is within close proximity to several attractions, such as Lake Crescent, the Sol Duc Hot Springs, the Hoh Rain Forest, Rialto Beach and LaPush Beach on the Pacific Coast. Olympic National Park is packed with things to see and activities to enjoy from wildlife watching to whitewater rafting. The Park offers excellent biking and hiking trails which wind through spectacular natural landscapes, such as the Olympic Discovery Trail and the Spruce Railroad. Lake Crescent is surrounded by a variety of both self-guided and guided hiking trails, some of which meander through the lowland forests and creeks, while others involved a bit of climbing. Favorite hiking trails in the Lake Crescent area include the Marymere Falls Trail, the Fairholme Campground Loop Trail, and the Moments-in-Time Trail. Lake Crescent offers an array of water-based fun, such as kayaking, canoeing, boat cruises and fishing. Kayaks and canoes can be rented, and the lake provides some of the best fishing in the Pacific Northwest. The large, deep lake has incredible visibility and is home to the one-of-kind Beardsley Trout, and Crescenti Trout, which can be caught under strictly catch-and-release rules.